The state disaster response force and locals under the supervision of the Tamenglong district administration continued search operations on the second day on Thursday to recover the bodies of two missing children. 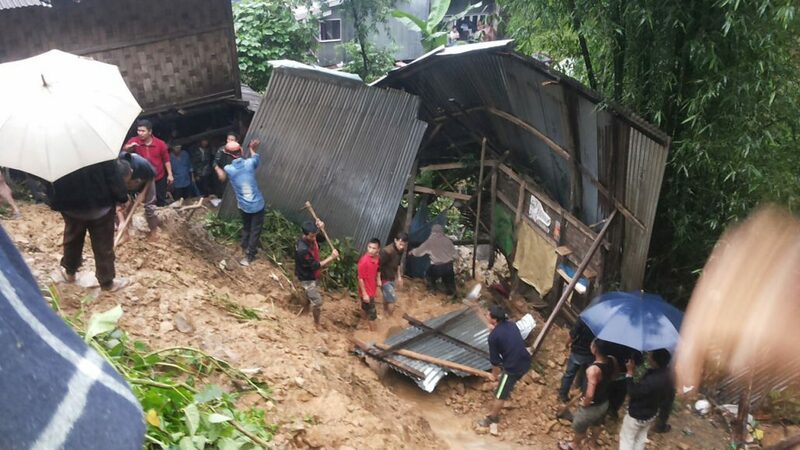 Seven bodies out of inine victims in a landslide that took place at three different places under Tamenglong town, about 150 km west of Imphal on Wednesday have been recovered. However bodies of two children of Lanthailung Kamei (40) of Tamenglong ward No.3 are yet to be recovered. Deputy Commissioner Ravinder Singh of Tamenglong district when contacted on phone confirmed the continuation of the search operations since morning after the rains stops at the district headquarters. He informed that there is no report of any recovery of the bodies. Earlier Chief Minister N Biren Singh assures ex-gratia of Rs 5 lakh each for next kin of the victims and other relief for the affected families. He also directed the district administration to open relief control room etc at the district headquarters. According to reports reaching here more than a dozen houses were completely damaged while around five others partially affected during Wednesday’s disaster. At this juncture another informed source said that most of the injured persons during Wednesday’s incident have been discharged from the health care centers at Tamenglong while one of injured is on its way to Imphal for further treatment. Meanwhile, the experts from the state environment directorate informed that Tamenglong incident was closely linked with the heavy rain in short duration with high intensity of rainfall may be treated as climate change event.